Only a few days before Christmas I thought it would be fun to just create something extra cool for this weeks blog post. I thought about something that would be different, but also useful in some way. So I started thinking about how I would like to get my deployment status messages, as I like to start my deployments without checking them al the time, and I came to Twitter. I’ve got my tweets everywhere, on my phone, my tablet, my laptop, etc. 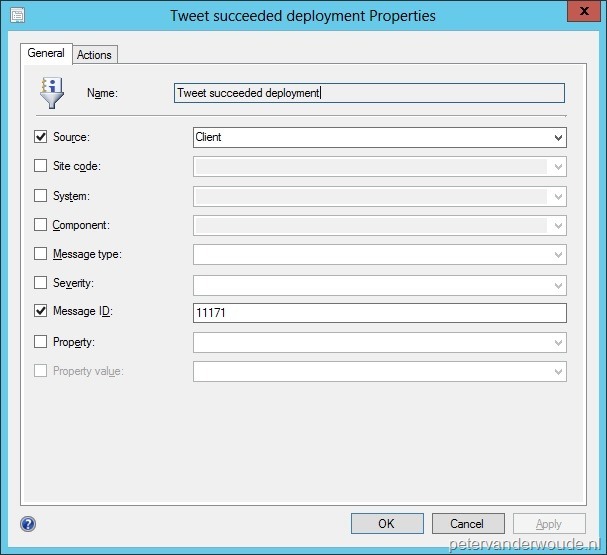 So wouldn’t it be cool to get the deployment status messages on twitter? 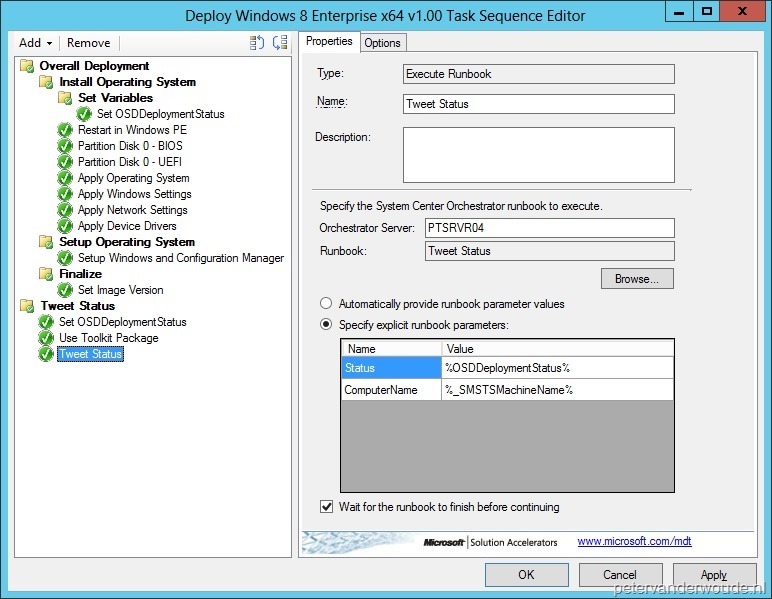 The Microsoft Deployment Toolkit 2012 Update 1 –package is created. The program SCOJobRunner is present on an accessible location for the Site server. The Site server is member of the OrchestratorUser –group. The Network Access Account is member of OrchestratorUser –group. The Social Media Integration Pack, of VIAcode, is registered, deployed and configured. Add an Initialize Data –activity and double-click it. In the Details Information click Add and a new parameter named Parameter 1 will be added. Now click Parameter 1 and change the name to ComputerName. Repeat that action and rename Parameter 2 to Status, click Ok and click Finish. Fill in the text “@pvanderwoude The deployment of “. Right-click and select Subscribe > Published Data. 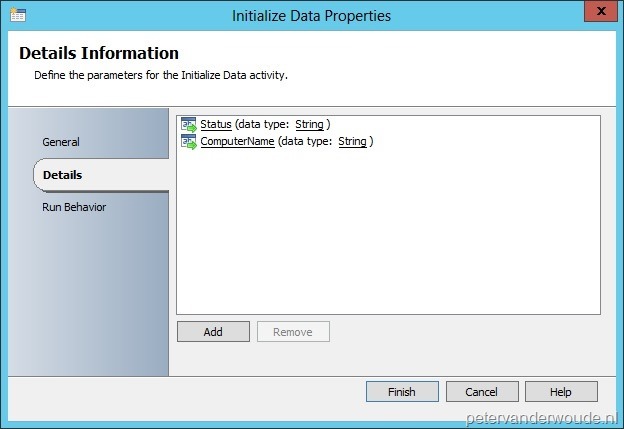 In the Published Data –popup, select with Activity Initialize Data, select ComputerName and click Ok. Fill in the text “ is “. Right-click and select Subscribe > Published Data. 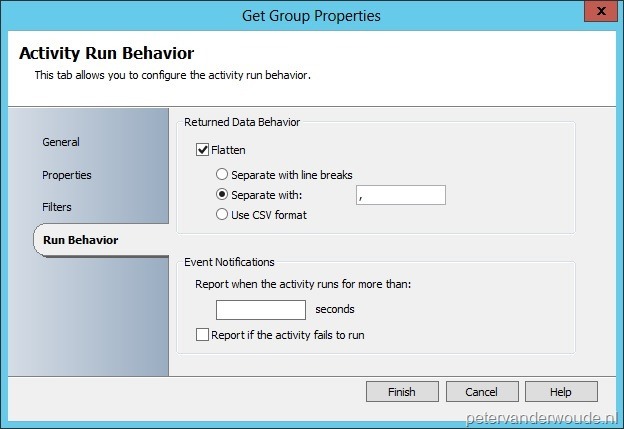 In the Published Data –popup, select with Activity Initialize Data, select Status, and click Ok. Fill in the text “!“. In the Home tab click Settings > Status Filter Rules, click Create and the Create Status Filter Rule Wizard will show. On the General page fill in as Name <aName> and select the following criteria and click Next. 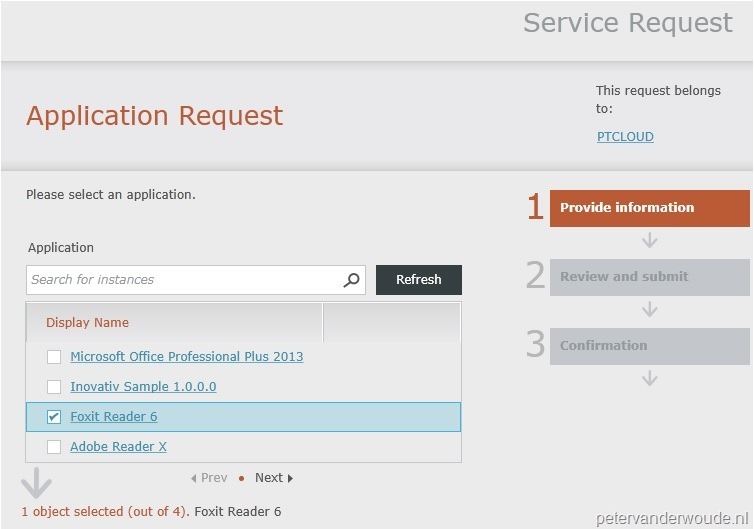 Select Source and then select Client. Select Message ID and fill in 11171. On the Actions page, select Run a program, fill in with Program <Dir>:\SCOJobRunner.exe -ID:”<aRunbookID>” -Webserver:”<aWebserver>” -Parameters:”ComputerName=%msgsys;Status=succeeded” and click Next. This was the configuration for a Status Filter Rule with a successful deployment. To create a Status Filter Rule for a failed deployment repeat the steps from above and replace 11171 with 11170 and replace succeeded with failed. One to set a new variable, OSDDeploymentStatus with a default value of succeeded. One to invoke the just created runbook with as input the name of the system and the status of the deployment. Add a New Group, fill in <aGroupName> and select in the Options –tab Continue on error. 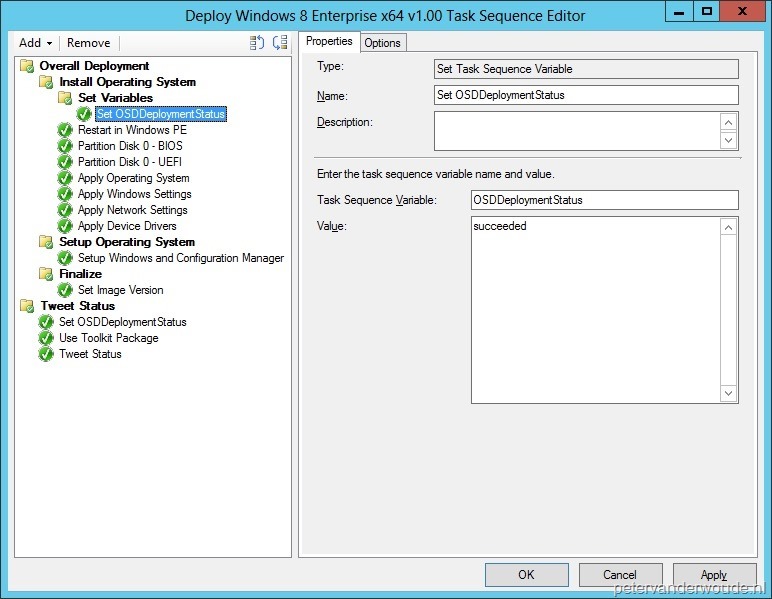 Add a Set Task Sequence Variable –step, set Task Sequence Variable to OSDDeploymentStatus and set Value to succeeded. Add a New Group and fill in <aGroupName>. 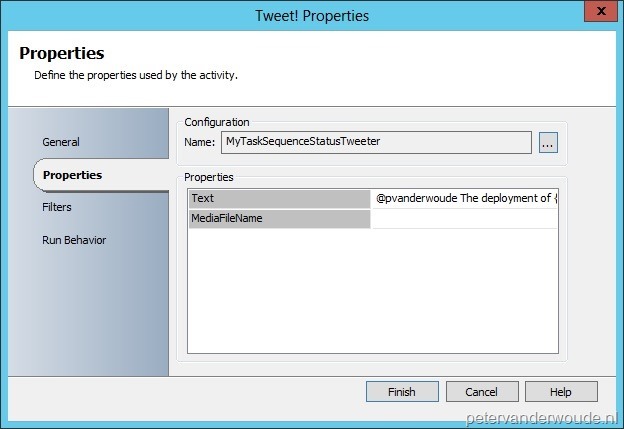 Add a Set Task Sequence Variable –step, set Task Sequence Variable to OSDDeploymentStatus and set Value to failed. Then go to the Options –tab and click Add Condition > Task Sequence Variable. In the Task Sequence Variable –popup, fill in as Variable _SMSTSLastActionSucceeded, set as Condition equals, fill in as Value False and click Ok.
Add an Use Microsoft Deployment Toolkit Package –step and Browse to the Microsoft Deployment Toolkit 2012 Update 1 –package. 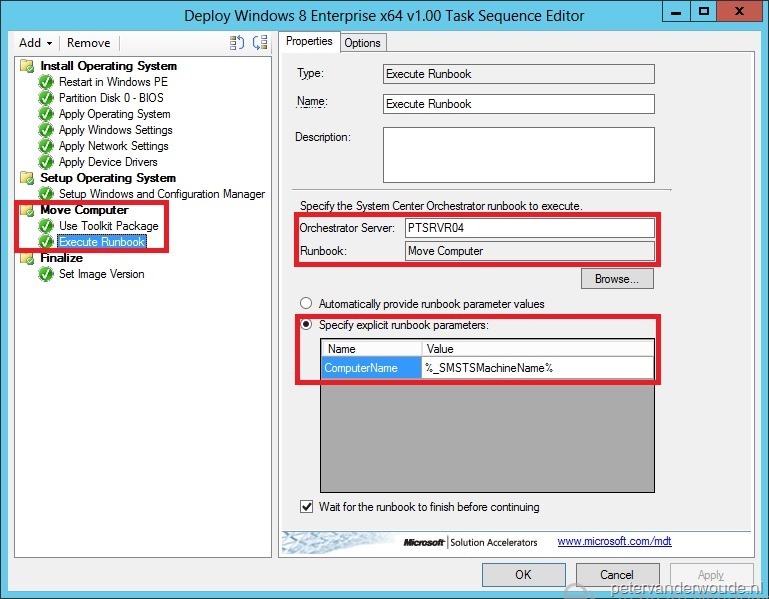 Add and Execute Runbook –step, fill in with Orchestrator Server <anOrchestratorServer> and Browse with Runbook to the just created runbook. Then select Specify explicit runbook parameters, fill in with ComputerName %_SMSTSMachineName%, fill in with Status %OSDDeploymentStatus% and select Wait for the runbook to finish before continuing. Last week I did a post about pre-provisioning user applications, based on group membership, during OS deployment, which I already thought was pretty cool. I got some nice positive feedback on that post, including a comment of my very well respected colleague and ConfigMgr MVP Kim Oppalfens. He said, “Nice find, but what if you have twenty applications?”. Well, my idea of last week would mean two task sequence steps per applications, so that’s not really an option for a lot of applications… I had to come up with something better. The biggest challenge about this is that Orchestrator can only return static variables, it’s not possible to return dynamically named variables from a runbook. This meant that the only option left, to really achieve my new goal, was to manually edit the ZTIExecuteRunbook.wsf –script from MDT to turn a static variable into multiple task sequence variables. So in rough lines my runbook has to return one string with all application groups and MDT has to turn it into multiple task sequence variables. The Nework Access Account is member of OrchestratorUser –group. Note: By default the Execute Runbook –step will use the credentials of the Network Access Account to connect with Orchestrator. The Active Directory Integration Pack is registered, deployed and configured. 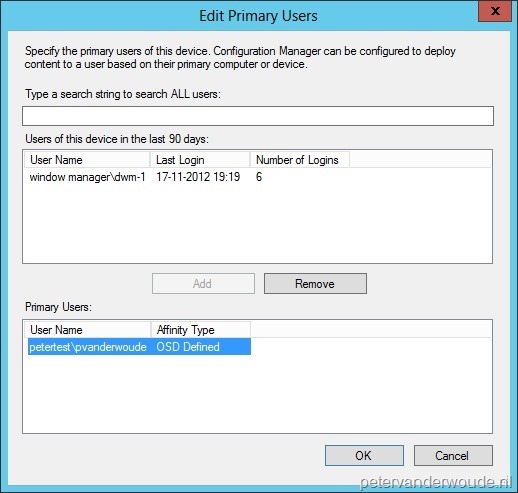 User device affinity is configured to Allow user device affinity with automatic approval in the PXE –tab of the Distribution Point Properties. Add an Initialize Data –activity and double-click it. In the Details Information click Add and a new parameter named Parameter 1 will be added. Now click Parameter 1, change the name to UserName, click Ok and click Finish. Add a Get User –activity, link it with the previous activity and double-click it. In the Filters click Add. In the Filter Settings –popup, select as Name Sam Account Name, select as Relation Equals, right-click the field next to Value and select Subscribe > Published Data. In the Published Data –popup, select with Activity Initialize Data, select UserName and click Ok, click again Ok and then click Finish. Add a Get Organizational Unit –activity, link it with the previous activity and double-click it. In the Filters click Add. In the Filter Settings –popup, select as Name Organizational Unit, select as Relation Equals, set as Value <aOUName>, click Ok and then click Finish. Note: This is an optional activity that I use for the next activity to only get specific groups used for application distribution. An other option might be to check on specific group names, or anything that makes the groups differ from other groups. Add a Get Group –activity, link it with the previous activity and double-click it. In the Properties click Optional Properties…. In the Add/Remove Property –popup select Search Root, click >> and click Ok. Right-click the field next to Search Root and select Subscribe > Published Data. In the Published Data –popup, select with Activity Get Organizational Unit, select Distinguished Name and click Ok. Then select Filters and click Add. In the Filter Settings –popup, select as Name Member, select as Relation Equals, right-click the field next to Value and select Subscribe > Published Data. In the Published Data –popup, select with Activity Get User, select Distinguished Name, click Ok and click again Ok. Then select Run Behavior, select Flatten and click Finish. Add an Return Data –activity link it with the previous activity and double-click it. In the Details right-click the field next to APPId and select Subscribe > Published Data. In the Published Data –popup, select with Activity Get Group, select Sam Account Name, click Ok and click Finish. Note: To get the APPId String in the Return Data –activity go to the Properties of the runbook and add it in the Returned Data. Also keep in mind that the runbook has to return APPId, to be functional, as the MDT –script (ZTIExecuteRunbook.wsf) will specifically check for that (see the next paragraph for an explanation). 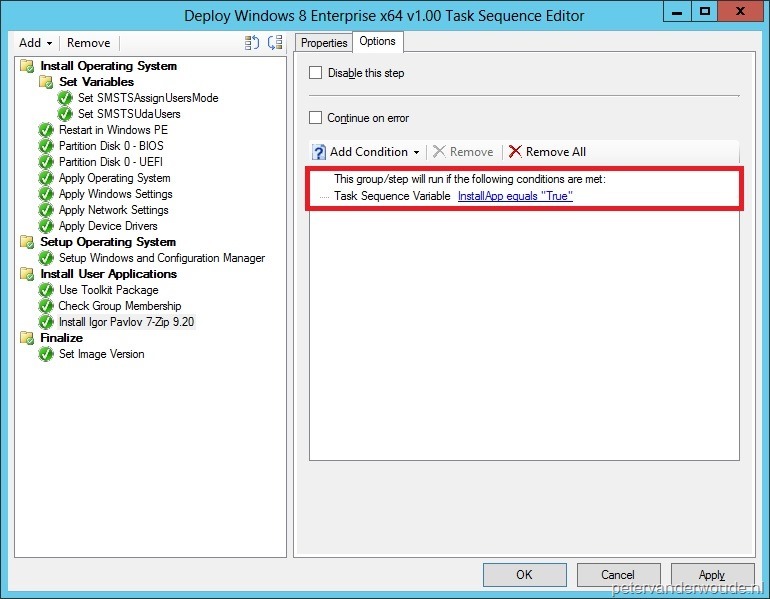 Add a Set Task Sequence Variable –step, set Task Sequence Variable to SMSTSAssignUsersMode and set Value to Auto. Add a Set Task Sequence Variable –step, set Task Sequence Variable to SMSTSUdaUsers and set Value to <DomainName>\%PrimaryUser%. Note: PrimaryUser is a variable that I use to set the primary user for a device (User Device Affinity) and to find the group memberships. There are many methods to set this variable and during this testing I used a computer variable for that. 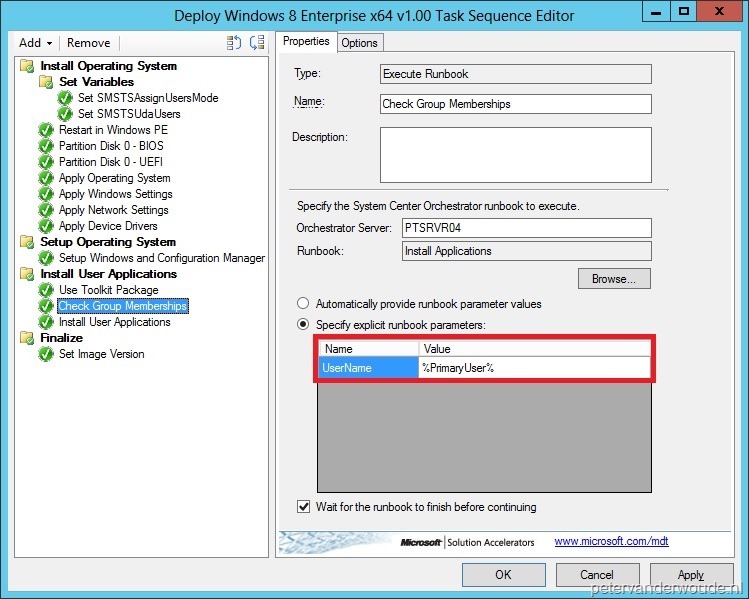 Add and Execute Runbook –step, fill in with Orchestrator Server <anOrchestratorServer> and Browse with Runbook to the just created runbook. Then select Specify explicit runbook parameters, fill in with UserName %PrimaryUser%, and select Wait for the runbook to finish before continuing. Add an Install Application –step, select Install applications according to dynamic variable list, fill in with Base variable name APPId and click Ok. Note: APPId is the variable that is returned by the runbook of the previous step. After the modifications to the ZTIExecuteRunbook –script it captures that variable and turns it’s value into multiple task sequence variables. Those variables now all contain the base variable name plus a number suffix starting at 01. Like last week, after all the configuring it’s now time to take a look at what the results are when the task sequence is done. This time I will show the results of how the application groups are passed on from the runbook to the task sequence. The first picture shows the application groups in the Output Parameters of the runbook in the Orchestrator Console. Then the second picture shows how the Execute Runbook –step (ZTIExecuteRunbook.log) processes the multiple groups into multiple task sequence variables and at last the third picture shows how the Install Application –step (SMSTS.log) processes the task sequence variables into applications that have to be installed. 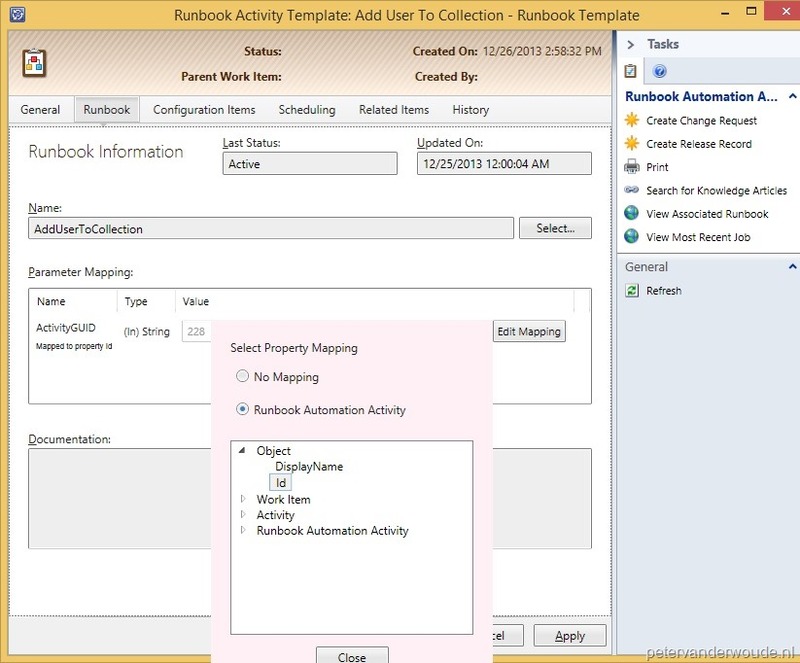 In case the name of the groups are not equal to the applications, that need to be installed, and it’s not possible to easily extract the application name from the group name, then it might be necessary to use a Map Published Data –activity in the runbook. This way it can easily turn a group name into an application name, but the biggest down-side is that it will be a static list.then. 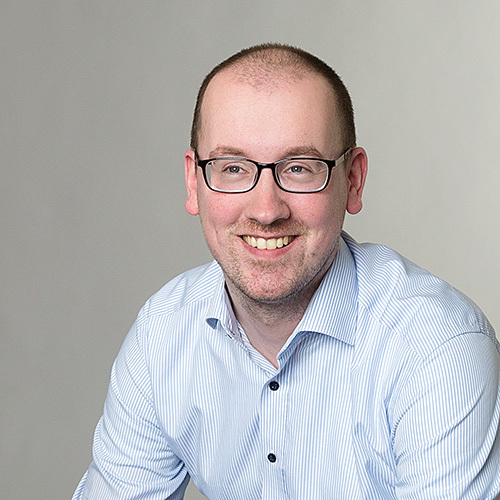 To end this post, I would like to thank my colleague Bart Timmermans for helping me better understand the (un-)logics of Orchestrator. This week it’s time for another, in my opinion, very cool post with the combination of Orchestrator and ConfigMgr 2012 (and MDT 2012 Update 1). In this post I want to use the user, set with User Device Affinity, to pre-provision applications, based on group membership, on a device during the initial deployment of the device. Out-of-the-box User Device Affinity can be used to pre-deploy user-targeted application to a device and it can be set during the deployment of a device. This way it will start receiving applications very quick after the deployment. 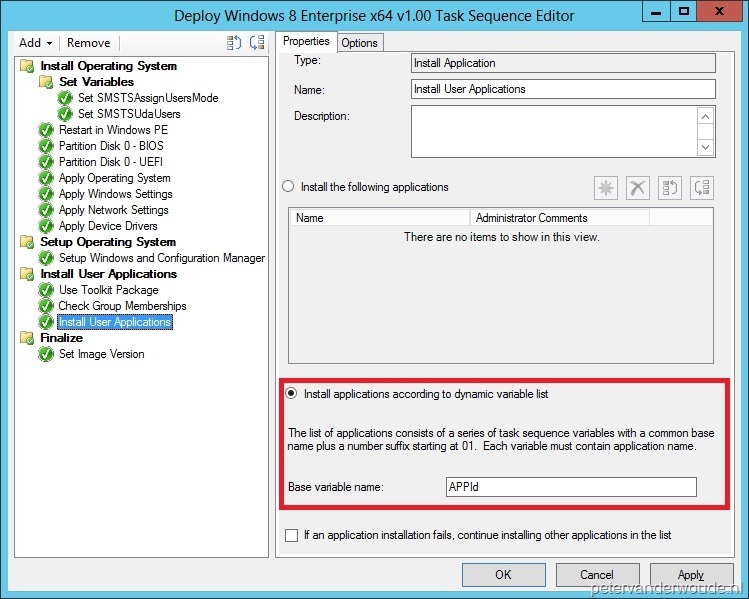 Basically I’m going to show in this post how to set User Device Affinity via a task sequence and how to use that username to install only specific applications for that user during the deployment of the device. Add an Initialize Data –activity and double-click it. In the Details Information click Add and a new parameter named Parameter 1 will be added. Now click Parameter 1 and change the name to GroupName. Repeat that action and rename Parameter 2 to UserName, click Ok and click Finish. Add a Get Group –activity, link it with the previous activity and double-click it. In the Filters click Add. In the Filter Settings –popup, select as Name Sam Account Name, select as Relation Equals, right-click the field next to Value and select Subscribe > Published Data. 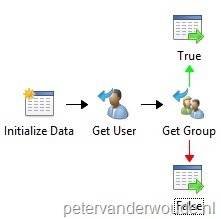 In the Published Data –popup, select with Activity Initialize Data, select GroupName and click Ok. Click another time Add. This time in the Filter Settings –popup, select as Name Member, select as Relation Equals, right-click the field next to Value and select Subscribe > Published Data. In the Published Data –popup, select with Activity Get User, select Distinguished Name, and click Ok and the click Finish. Add an Return Data –activity link it with the previous activity and double-click the link. In the Include click Get Group and change it to Count. Then click value and set Count equals to 1. Now double-click the new activity, set InstallApp to TRUE and click Finish. Repeat these actions, but the use for Count equals 0 and for InstallApp False. Note: To get the InstallApp String in the Return Data –activity go to the Properties of the runbook and add it in the Returned Data. Add and Execute Runbook –step, fill in with Orchestrator Server <anOrchestratorServer> and Browse with Runbook to the just created runbook. Then select Specify explicit runbook parameters, fill in with GroupName <anApplicationGroupName>, fill in with UserName %PrimaryUser% and click Ok.
Add an Install Application –step, select Install the following applications and select New (yellow start). In the Select the application to install –popup select the application that belong the <anApplicationGroupName> and click Ok. Go to the Options –tab and click Add Condition > Task Sequence Variable. In the Task Sequence Variable –popup, fill in as Variable InstallApp, set as Condition equals, fill in as Value True and click Ok. Note: InstallApp is a variable that is returned by the runbook of the previous step. That step is so cool that it captures that variable and turns it into a task sequence variable. After all the configuring, it’s now time to take a look at what the results are when the task sequence is done. As always there are lot’s of place to show the success of the different actions, so I had to pick a few. I tried to pick those that tell the most information from a picture. The first result is of setting the primary user during the task sequence. In the Edit Primary User –popup it will show that with Primary Users a user is set with the Affinity Type of OSD Defined. The second results are of the success of finding the user in the group. It show the Output Parameters of the runbook in the Orchestrator Console and under there the Execute Runbook –step (ZTIExecuteRunbook.log) processing the variable and its value. The power of Orchestrator 2012 to automate actions is getting bigger and bigger, as the community for it grows and by that the number of Integration Packs (IPs). Of course there are also IPs for ConfigMgr, from both Microsoft itself and the community (via CodePlex). Besides that there wasn’t a real integration between ConfigMgr and Orchestrator, yet, but with MDT 2012 Update 1 a really nice new cool feature was introduced. 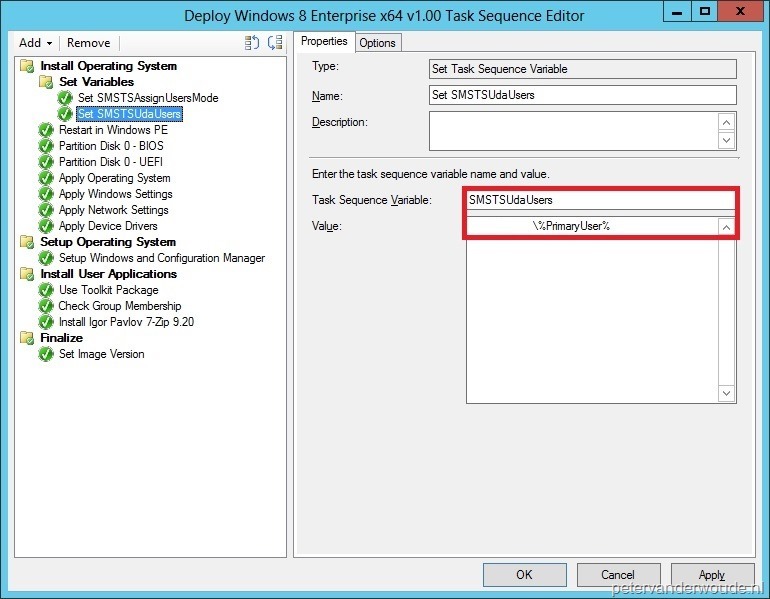 This feature is the Execute Runbook –step during a Task Sequence. It gives anyone, with or without real programming skills, more robust options during a Task Sequence, as long as an IP exist for the action anyone wants to perform. Just remember, lots of these IPs are created by the community. So deliver useful feedback on them, or even better add your own actions, or IPs. 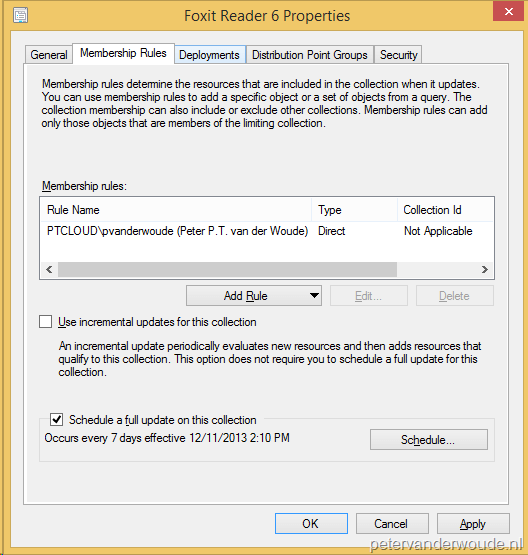 A Microsoft Deployment Toolkit 2012 Update 1 –package. This package contains the necessary scripts to execute a runbook during a task sequence. The Nework Access Account needs to be “Orchestrator User”. By default the Execute Runbook –step will use the credentials of the Network Access Account to connect with Orchestrator. 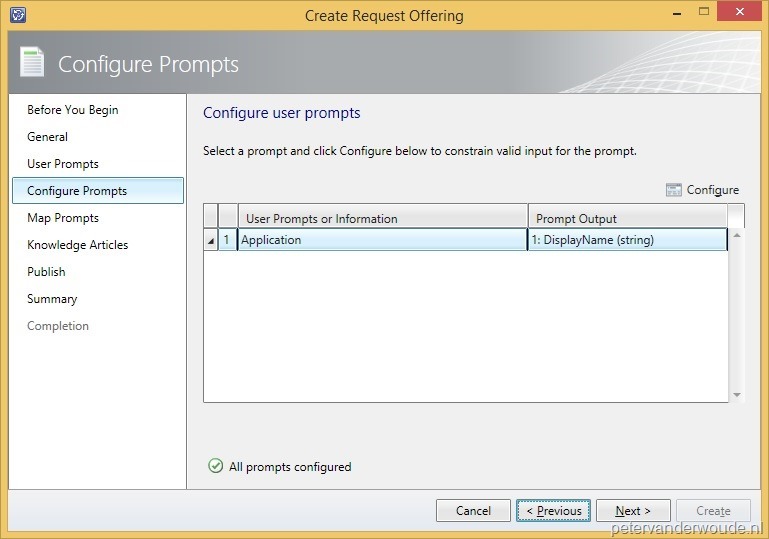 Register, Deploy and Configure the Active Directory IP from Ryan Andorfer. 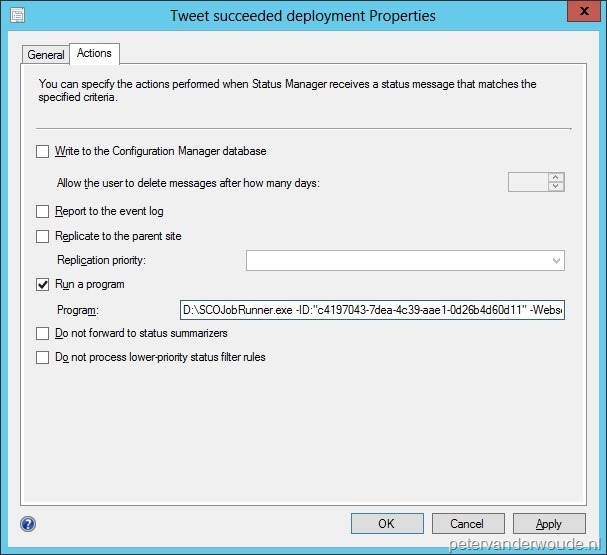 I used this one, because it was easy to set up and, even more important, it works (even with Orchestrator 2012 SP1 BETA)! The account used in the Connection Credentials needs to be at least member of the Account Operators –group in the Active Directory (AD). Otherwise it can’t move an object in the AD. Add an Initialize Data –activity and double-click it. In the Details Information click Add and a new parameter named Parameter 1 will be added. Now click Parameter 1 and change the name to ComputerName click Ok and click Finish. Add a Get Object DistinguishedName –activity, link it with the previous activity and double-click it. In the Properties, fill in with DomainName <aDomainName> and fill in with Object Class computer. Then right-click the field next to Object Name select Subscribe > Published Data. In the Published Data –popup, select with Activity Initialize Data, select ComputerName, click Ok and then click Finish. Add a Move AD Object –activity, link it with the previous activity and double-click it. In the Properties right-click the field next to Source Object LDAP Path select Subscribe > Published Data. In the Published Data –popup, select with Activity Get Object DistinguishedName, select Object_LDAP_Path and click Ok Then fill in with Destination Container OU LDAP Path <aOULDAPPath> and click Finish. Note: Of course the Destination Container OU LDAP Path can also be (partly) filled with a Published Data. This basic sample is just to show the possibilities. Add and Execute Runbook –step, fill in with Orchestrator Server <aOrchestratorServer> and Browse with Runbook to the just created runbook. Then select Specify explicit runbook parameters, fill in with ComputerName %_SMSTSMachineName% and click Ok. 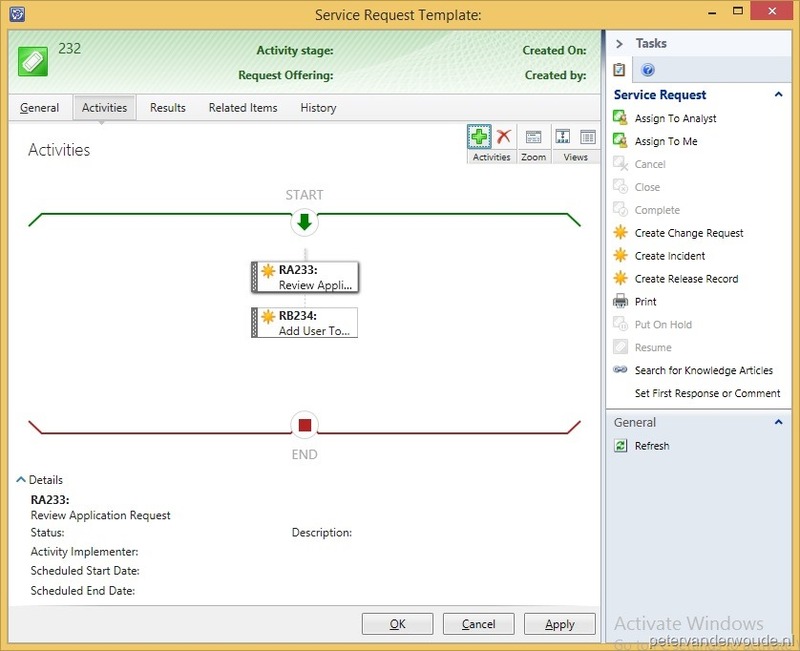 Note: By doing this the ComputerName –parameter from the Initialize Data –activity will be set to the computer name of the system running the task sequence.